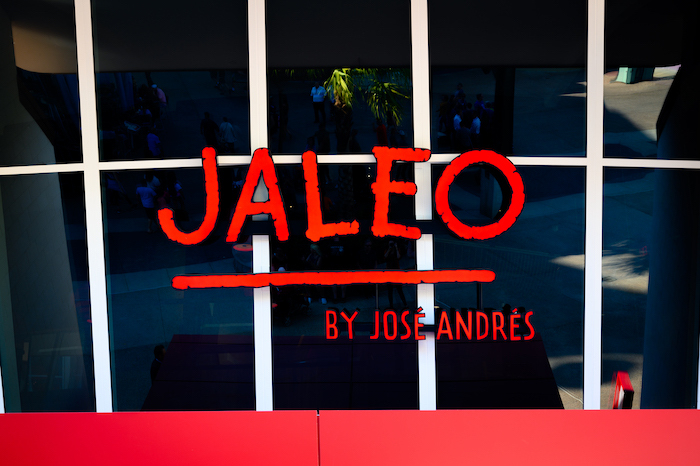 Join us for a recap of our experience at the exclusive grand opening party for Jaleo! First of all, we would like to thank Disney for inviting us to this exclusive grand opening party for Jaleo at Disney Springs! This was a private event that was exclusive to media and invited guests, so all food was provided free of charge. With that being said, please know that we are always honest when we recap these events! 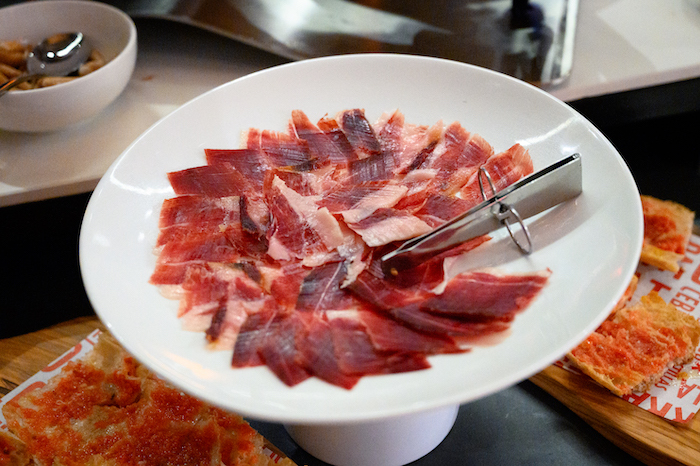 The very first Jaleo restaurant opened in Washington D.C. in 1993 and introduced the U.S. to Spanish tapas dining. 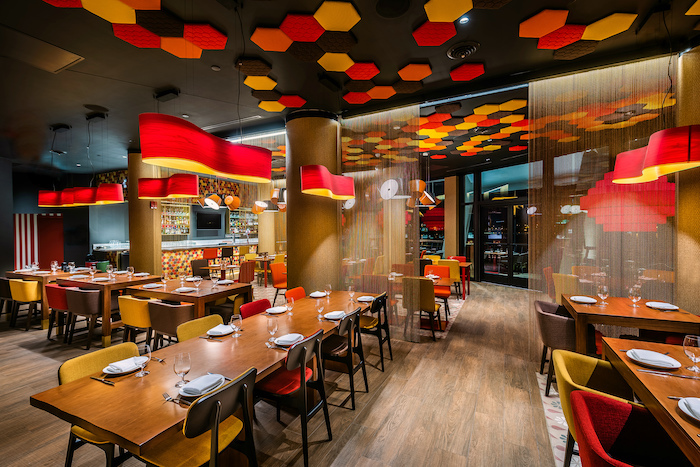 Jaleo, which means “revelry,” represents the very best of Spanish cuisine and design. 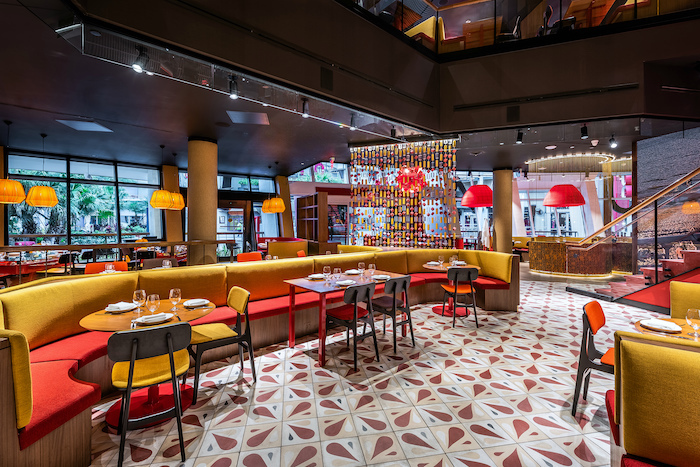 Under the guidance of Chef José Andrés, the restaurant offers an unparalleled tapas experience. 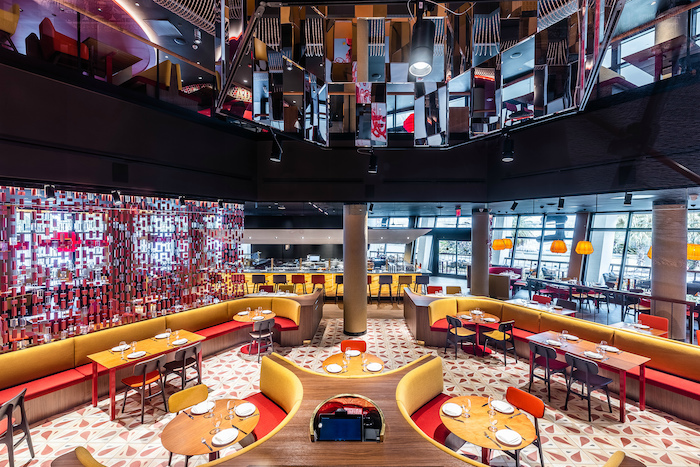 The Disney Springs location opened its doors for dinner service just a few days ago on March 17, 2019. Lunch service will begin later in the month. 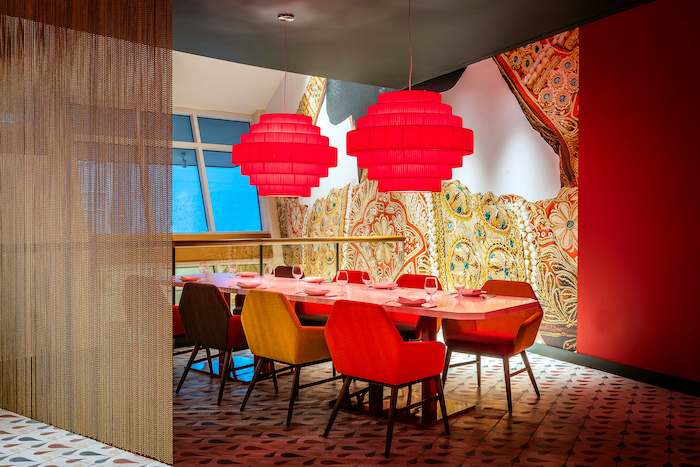 The red and yellow décor is inspired by Spanish design. Photo courtesy of ThinkFoodGroup. 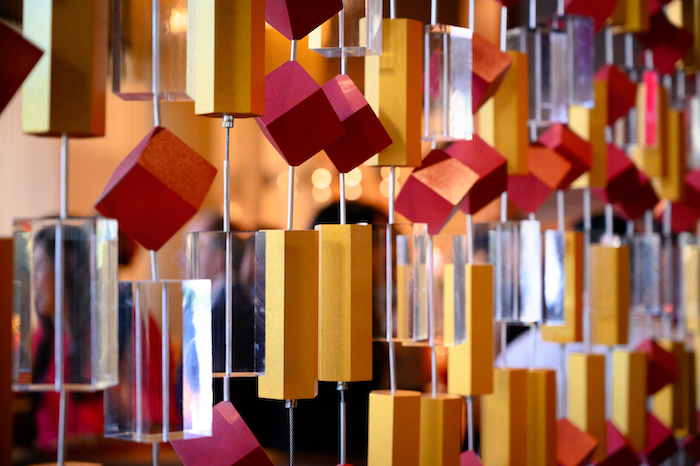 The interior décor of the restaurant is nothing short of gorgeous! 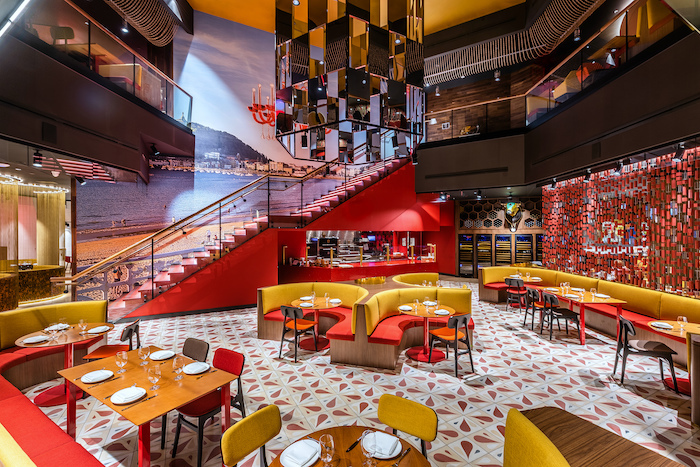 The bright red and yellow color palette really allows the Spanish influence to shine. An example of one of the larger-than-life murals. Photo courtesy of ThinkFoodGroup. 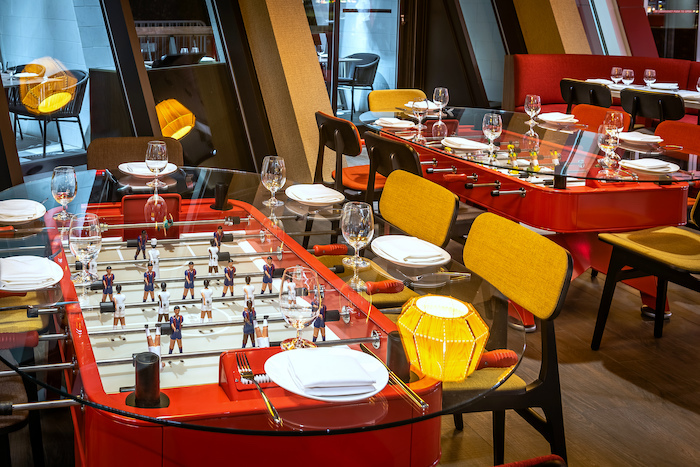 Take a look around and you’ll find larger-than-life murals, unique lighting fixtures, thousands of colorful tiles, and even a foosball table… table! An example of one of the unique lighting fixtures. Photo courtesy of ThinkFoodGroup. How fun is this table?! Photo courtesy of ThinkFoodGroup. Upon entering the restaurant, we were greeted by a line of servers handing out signature cocktails and a selection of red and white wines. 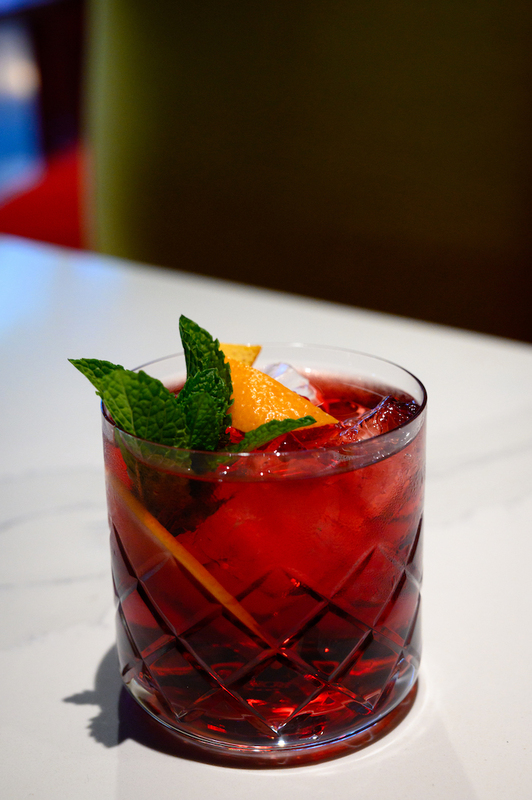 I immediately grabbed a glass of the Sangría Roja, which pretty much did not leave my side for the entire night! My favorite drink at the party was definitely the sangria. Photo by Courtney Reynolds. 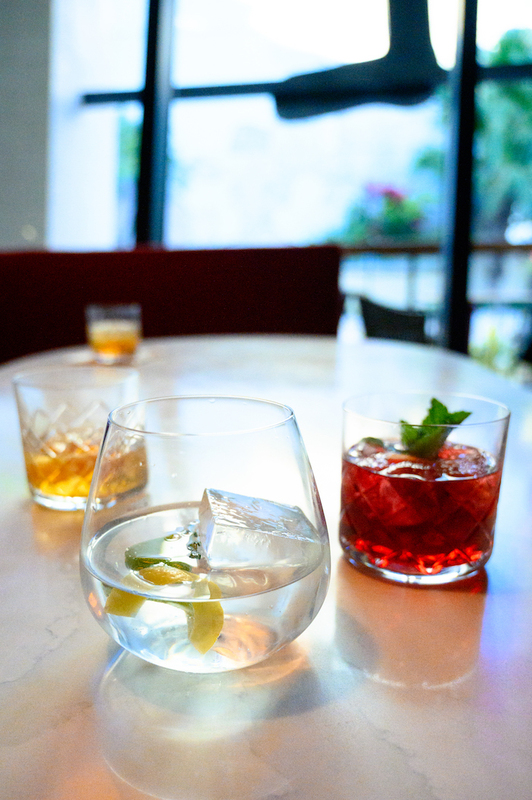 Our selection of drinks. Photo by Courtney Reynolds. Before sitting down to try some of the food, we explored the restaurant a little bit. The décor (shown above) looks like it was plucked right out of the concept art! The restaurant itself is grand in scale, but the details are the best part. There are a few meal prep stations where you can watch the chefs create dishes right in front of you. You can watch the chefs create dishes right in front of you. Photo by Courtney Reynolds. There is also an open kitchen where you can watch the chefs cook their famous paella! 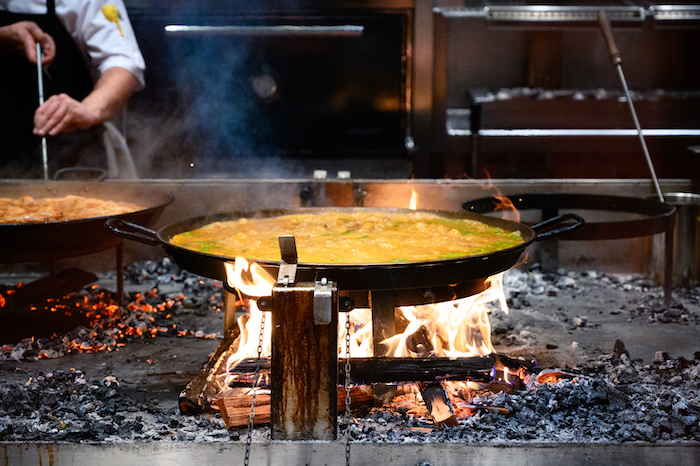 You can watch the chefs cook their famous paella in the open kitchen. Photo by Courtney Reynolds. 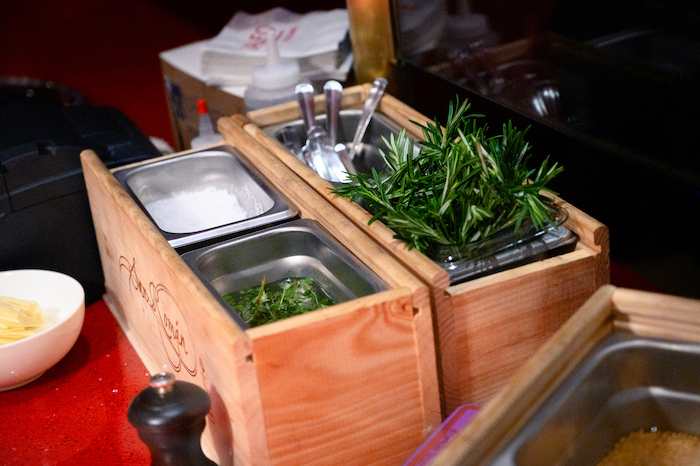 Fresh herbs and ingredients spotted in the open kitchen. Photo by Courtney Reynolds. 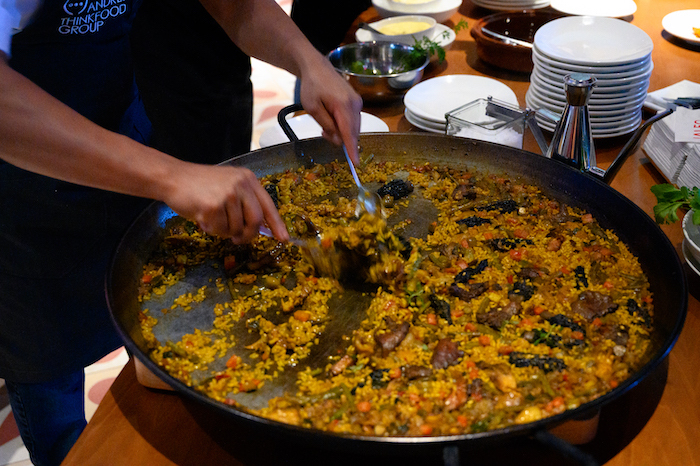 Chefs will plate your paella tableside. Photo by Courtney Reynolds. I wouldn’t say I’m a very adventurous eater, so I was a bit wary about the menu at first glance. In my mind, paella was this weird seafood rice dish that I wanted nothing to be a part of. I had no idea that there were paella recipes that didn’t include seafood! I decided to give it a go and grabbed a plate of the Paella Valenciana, a classic paella made with chicken, rabbit, lima beans, green beans, and saffron. It was so good that I went back and grabbed another plate! 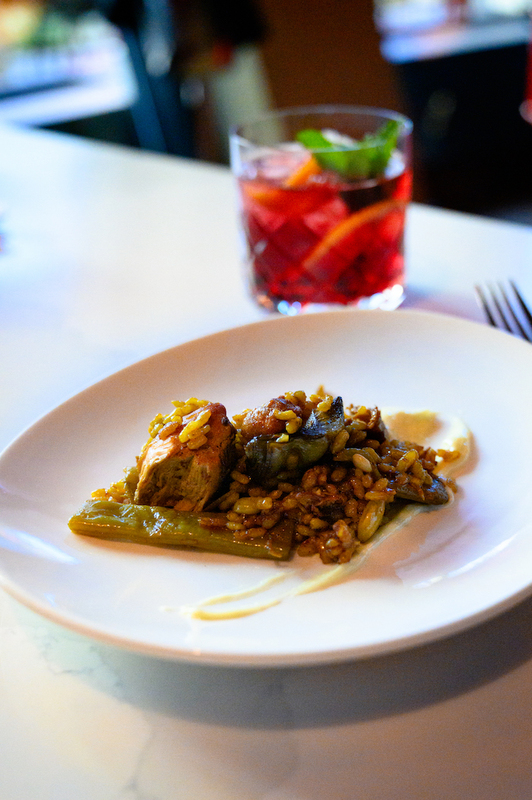 This is the dish that will keep me coming back to Jaleo over and over again. The chicken paella will keep me coming back to Jaleo. Photo by Courtney Reynolds. 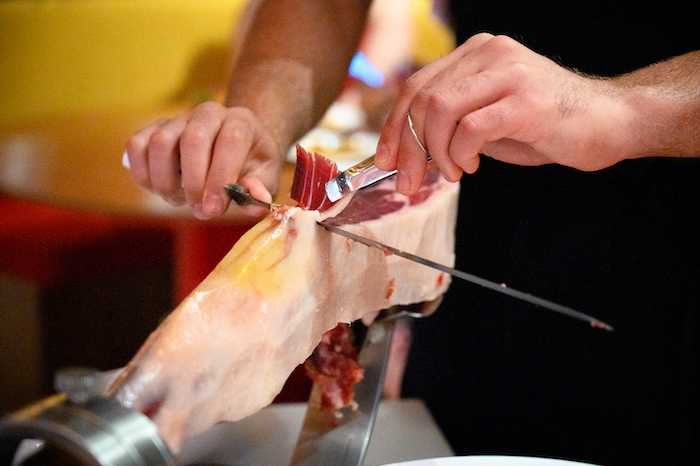 You can order the cured ham to be carved tableside. Photo by Courtney Reynolds. A plate of freshly carved cured ham. Photo by Courtney Reynolds. If I had to choose a favorite, it would be the endives with goat cheese. They were the perfect blend of sweet and salty! 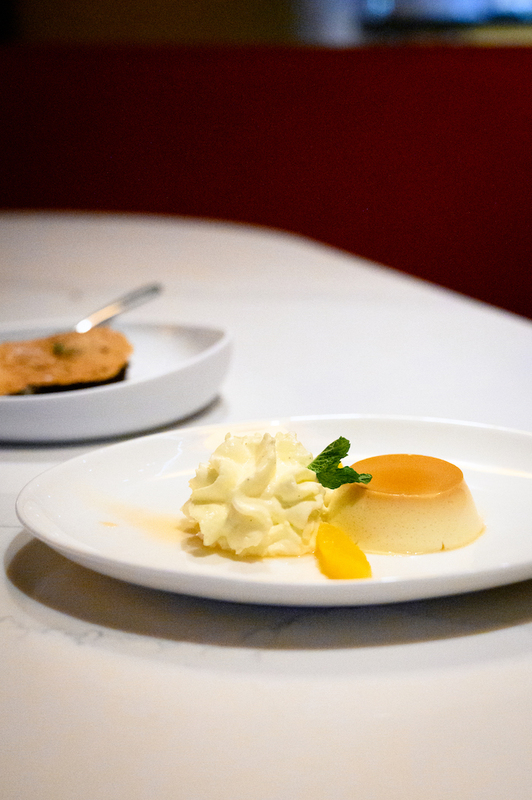 The classic Spanish custard had a nice citrus kick. Photo by Courtney Reynolds. We also tried a small sample of the strawberry sorbet from Pepe, a small quick service location inspired by Chef José Andrés’ wildly popular Spanish food truck of the same name. We decided to stop by and take a peek inside before leaving the grand opening party! You can find the entrance right next door to Jaleo. Photo by Courtney Reynolds. Next to the walk-up ordering counter, there is a small seating area with tables and a counter for dining. 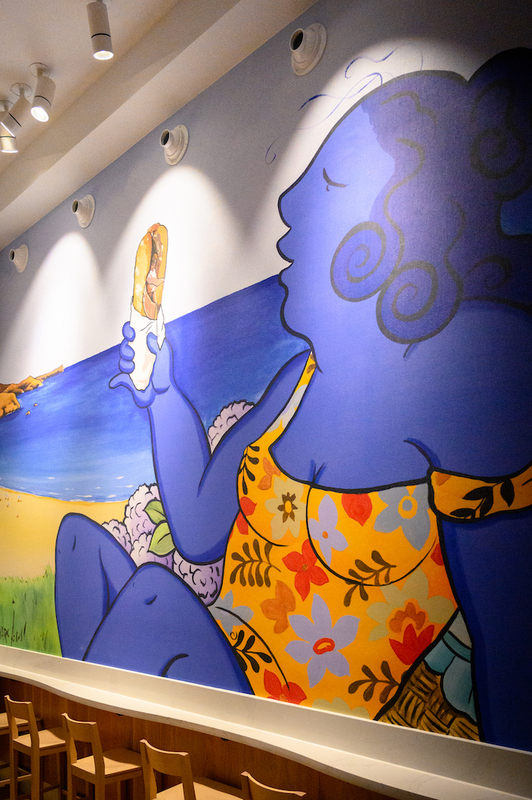 A large painted mural can be found on the wall. Photo by Courtney Reynolds. Menu highlights include hot and cold Spanish sandwiches as well as gazpacho and salads to go. Alcoholic and non-alcoholic beverages are also available. This is a great alternative quick service option for guests on the go! 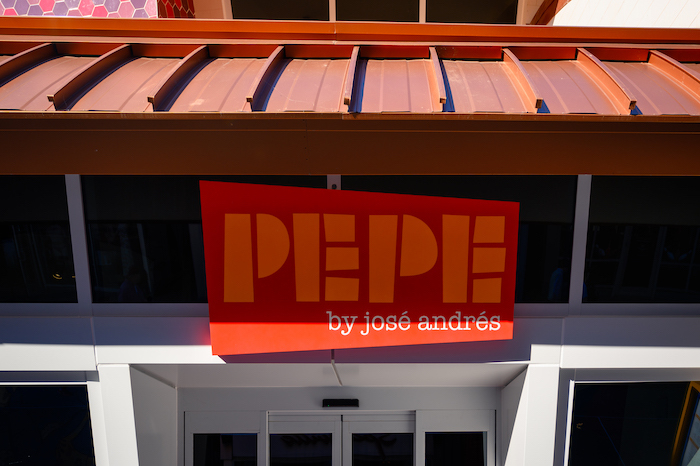 Here is a selection of what’s available at Pepe. Photo courtesy of ThinkFoodGroup. 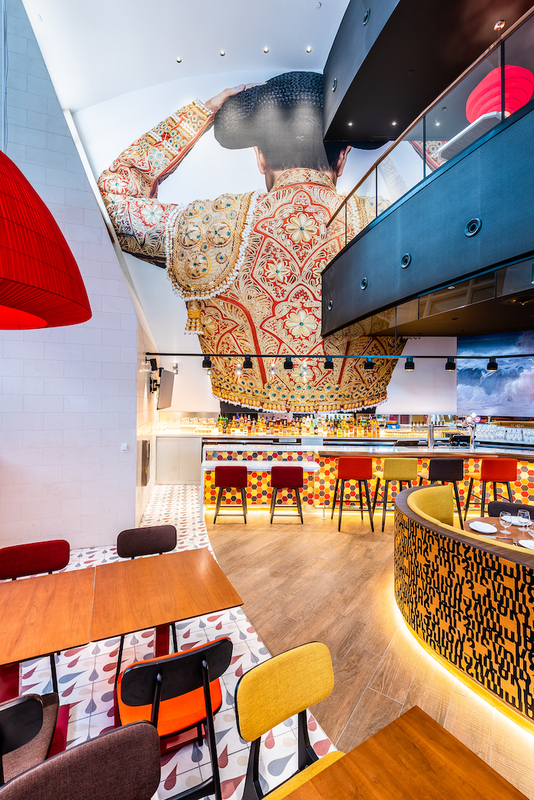 Jaleo is an incredibly impressive new addition to Disney Springs for many reasons. The décor is absolutely stunning and the food is unique and creative without being too intimating. There are certainly a few bold items on the menu but I think those with less adventurous palates will still find something to enjoy. We were given just a small glimpse of what this restaurant has to offer and I already can’t wait to go back! 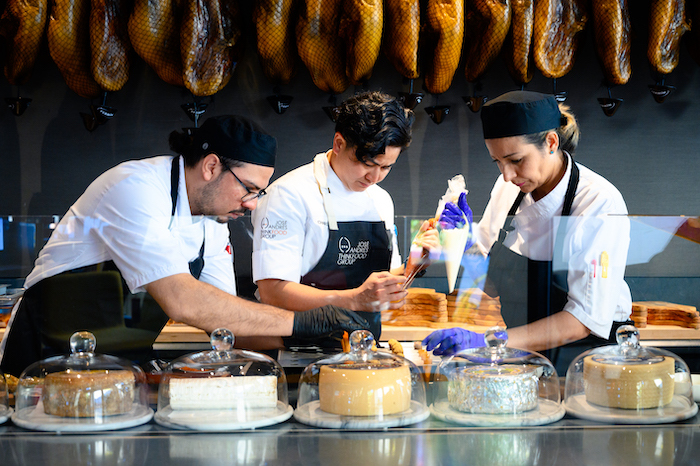 To learn more about Jaleo and to check out the complete menu, click here. 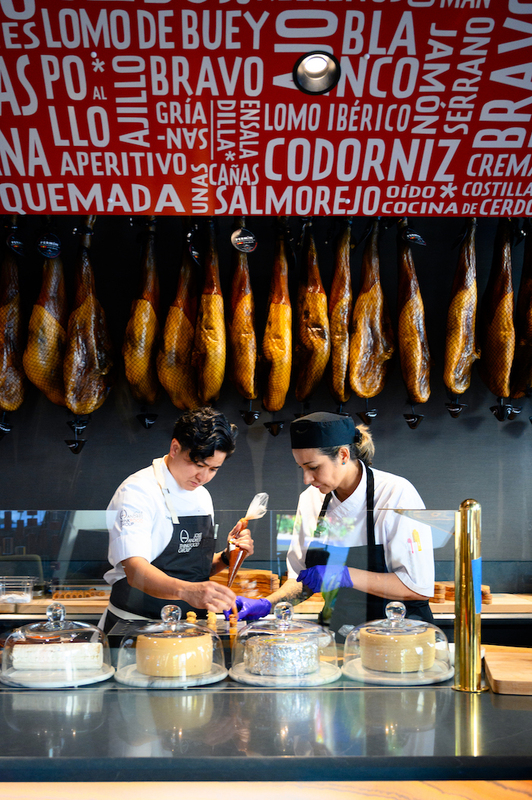 Do you love learning more about dining options like Jaleo at Disney Springs? Subscribe today!